The sun is a free source of natural light but the intensity of this light varies constantly throughout the day. Uncontrolled this can create glare and visual discomfort. Solar shading provides the required level of control allowing the harvesting of daylight to reduce artificial lighting and improve wellbeing and productivity. Poor levels of day lighting – insufficient daylight exposure is common in industrialised countries; laboratory and in-field studies have associated negative behavioural effects such as depression and reduced vitality. Discomfort glare – this is due to excessive levels of exterior luminance within the field of view, inadequate contrast or direct sunlight incident on the occupant’s visual focus. 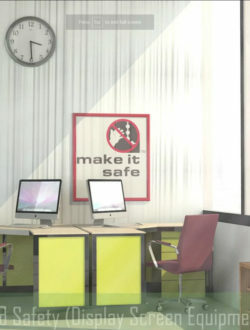 Inadequate colour rendition – depending on the type of artificial light, a poor colour rendition can occasionally have detrimental effects in terms of stress levels and productivity. Lack of contact with the outdoors – inadequate visual contact with the outside world has a negative impact on quality of life, sleep and wellbeing. Direct sunlight can be in excess of 100,000 lux, by contrast the typical recommended level for a workstation is 500 lux. Dynamic solar shading allows daylight levels to be accurately controlled within comfortable limits irrespective of the variability of external illuminance throughout the year. Solar shading integrated with clear glazing is associated with a high Colour Rendering Index (CRI), which is the accurateness in rendering the colours across the visible spectrum. 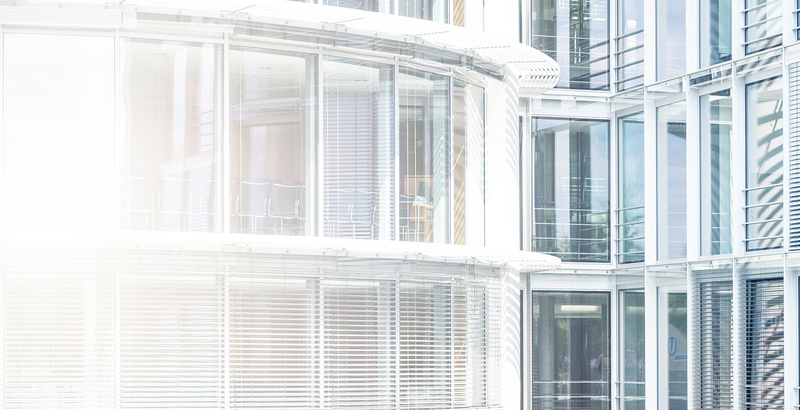 In contrast, solar control glass limiting solar gain can negatively affect the quality of light as well as the glass light transmission potentially undermining the minimum daylight provision prescribed by the Building Regulations. Blinds and shutters can also block light entry for rooms that require high levels of dim-out such as laboratories. As we spend around 90% of our time indoors being exposed to an uncomfortable visual environment has detrimental effects on our wellbeing. The preference for daylighting as opposed to artificial lighting is proven in buildings. Daylight is circadian-effective and triggers positive emotional, attitudinal and cognitive responses in the individual (Strong, 2012). Heschong Mahon Group have proved a statistically compelling connection between daylighting and student performance – see here. The World Green Building Council estimates that, in an office environment, a worker exposed to daylight and visual contact with the outside sleeps 46 minutes more per night as opposed to a worker in an office with no natural light. Connection with nature, termed as biophilia, in particular has recently emerged as important in work environments. A study on the impact of biophilic design of the office space estimated that proximity to natural elements such as greenery and sunlight was associated with 15% improved wellbeing and creativity and 6% higher productivity. The top two elements ranked desirable by office workers were daylight and indoor plants (Human Spaces, 2015). To make best use of daylighting, regulation is needed to address discomfort glare and achieve appropriate levels of luminance, as excessive exterior luminance is often detrimental to visual comfort (Beck et al., 2010). The 1992 Health and Safety (Display Screen Equipment) Regulations stipulate that windows shall be fitted with adjustable covering to attenuate the intensity of sunlight on the workstation. 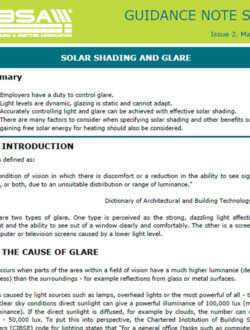 Visible light transmittance, often shortened to Tvis or Tv is the proportion of visible light transmitted through shading or glazing products. A Tvis of 5% means that 5% of the visible light is transmitted and so 95% rejected. See the resources on this page for more information.